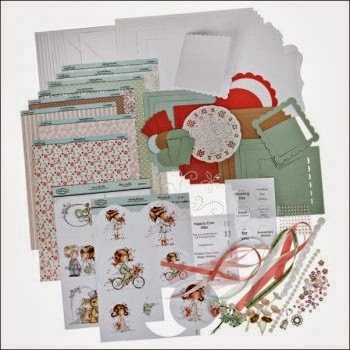 and the prize is - Hobby House 'Spring Bringer And Love Me Do' Cardmaking Kit. Now you should have arrived here from Kelly and your next stop is Sharon, but if you get lost, the full list is back at Ready Teddy Go and good luck. 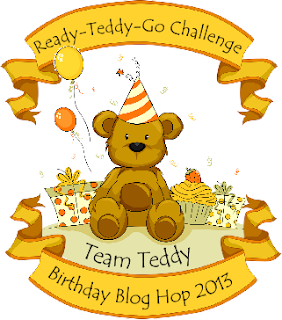 Now pop over to Ready Teddy Go and check out, what the rest of the talented team have done. I was unable to use the images provided, as i use Twinkling H20's and the colours and ink were just not happy, so i decided to use one of my trusty PB's and this time it's 'Natural Trail Ted' and i have paper pieced him, the papers are - Doodlebug, that i bought in a Cricut pad in America about 4 years ago, the brads are - Papermania and they started life green ! !, so i lightly sanded them, inked them and dried the ink with my embossing gun and then lightly sanded again, so faint green is showing through. The Sentiment is - LOTV and the rope twine in the middle was in my stash, i've lightly gone over with Tim Holtz - 'Tea Dye and Dried Marigold' - This card is going to H's Beaver leader 'Stuart' tonight and i have got all the Beavers to sign it as well. Crafty Catz - where they are Celebrating their 4th Birthday and 200th Challenge too. Your card is gorgeous Sam, I love the cute image, beautiful papers and fabulous layout too. Apologies for the sticky/pasty comment Sam but the fingers and hands are not playing the computer game at the moment, but still like to have a peek, say hello and great work as always. Such an adorable card, your design is fabulous and I love your sweet image - great colouring and lovely details!! Darling little bear, Sam, and love how you colored him up. Great colors too. Fabulous card Sam - love the cute image and perfect paper piecing and the brads are soooooo cute. Gorgeous card Sam, I like the sweet image and the papers. Good job of paper piercing and a Happy 2nd Birthday to Ready-Teddy-Go !! Love your card - so different from the others. Great for a guy. This is really cute... I love this bear and the papers for the card! Aawww this is sooooo gorgeous Sam! This is one of my fave PB bears and I love the papers too! Fabulous, adorable card, luv his paper pieced dungarees. This is fab Sam, that image is just darling, and those papers are fabulous :D Just gorgeous! Love it! What a beautiful card. I love your colour choices which are just perfect for our Autumn Colours challenge over at Crafty Little Fairies. I hope you will come back and join as again soon. A gorgeous card. Such a cute image and lovely autumnal colours. Great blog hop too. He is gorgeous Sam and I love the paper piecing..fabulous card. love this image so different from the norm but still cute,thanks for sharing. What a cute little Teddy and I love his paper pieced trousers.